DETROIT – Mike Babcock needed to get something off his chest. It happened after the coach was asked about Petr Mrazek’s ability to shake off poor performances – like Saturday’s 5-1 loss in Game 2 at Tampa Bay – and bounce back to lead the Red Wings to subsequent wins – like he did Tuesday night at Joe Louis Arena. Well, like it or not, Mrazek had perhaps his best, certainly his more important, bounce-back effort of his young NHL career. Making just his third career playoff start, Mrazek stopped all 22 shots he faced, and the Red Wings got enough offense on goals by Pavel Datsyuk, Riley Sheahan and Luke Glendening to claim a 3-0 win over the Lightning in Game 3, to grab a 2-1 series lead in their Eastern Conference first-round matchup. Game 4 of the best-of-7 series is Thursday at 7 p.m. EDT at Joe Louis Arena. The 23-year-old Mrazek is the first Wings rookie to earn a postseason shutout since Jimmy Howard blanked Phoenix in Game 4 of the 2010 Western Conference quarterfinals. The Wings’ coach may not be enamored by the bounce-back phrase, but captain Henrik Zetterberg doesn’t have a problem with the young goalie’s ability to dust off the occasional bad start. Typically low key, the unabashed rookie embraces pressure. It definitely showed during six penalty-kill situations, which were all extinguished by the Red Wings’ special teams units. 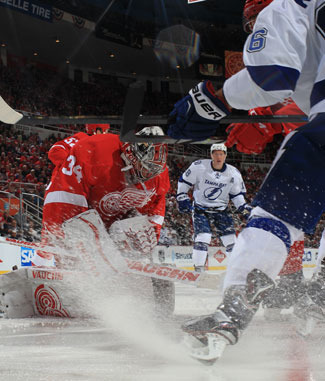 Mrazek did his part, stopping all six of the Lightning’s power-play shots. Clinging to a 1-0 lead early in the second period, the Wings killed off a 56-second two-man disadvantage. It helped that Lightning center Tyler Johnson, who already has two goals in the series, hit the goal post during the sequence. “When I saw 5 on 3 for, I think, one minute power play, that was a huge part of the game,” Mrazek said. “After that the game came on our side I would say a little bit." Mrazek also denied Lightning center Brian Boyle on a shorthanded breakaway attempt 8:30 into the third. Boyle scored a similar goal on Mrazek in Game 1. But in the same way he dealings with demoralizing losses, Mrazek doesn’t allow himself to hold on too long to the sweet success of victory either. On the five occasions that Mrazek has been relieved of a start this season, he has responded by posting a 4-0-1 record with a 1.38 goals-against average and .962 save percentage in the five starts, including Tuesday, that followed the games in which he was replaced. Someone else who was on his game was Justin Abdelkader, who was making his 2015 playoff debut. The Red Wings’ rugged forward rushed to Mrazek’s defense when the goalie was bowled over during a short-handed situation by Lightning center Cedric Paquette late in the third period. Abdelkader missed the past six games with a hand injury that he sustained while blocking a shot in Minnesota more than two weeks ago. Aside from the roughing penalty in the third, Abdelkader made a beautiful play to set up Sheahan’s power-play goal earlier in the period.